I wish I could take credit for this recipe because, OMG, it’s so good, but it comes from Alton Brown (minus the tzatziki recipe). 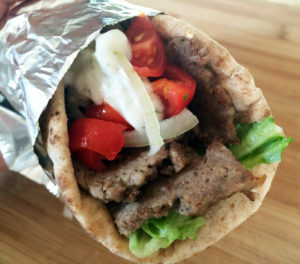 I’m a huge fan of gyros, and this is as close to the real thing you can get by making them at home. The recipe is a little time-consuming, so plan ahead and make sure you give yourself enough time — it’s so worth the effort. Refrigerate for a few hours before serving. In a food processor, pulse the onion several times. Scrape them into a tea towel and gently squeeze out and discard as much liquid as possible. *Return the onion to the food processor and add the remaining ingredients. Turn on and process until the ingredients have combined into a paste-like mix, scraping down the sides as needed. Scrape mixture into a loaf pan, and gently press evenly into the pan. Place the loaf pan in a water bath (set it in a 9x13-inch cake pan and add about 2 inches of water to the cake pan), and bake for 60-75 minutes, until the meat mixture reaches 160 to 175 degrees. Remove the loaf pan from the oven, and gently pour off any grease. Wrap a brick with foil, and place it directly on top of the meat for about 15-20 minutes to compress the loaf and allow it to continue cooking. If you don't have a brick, remove the meat from the loaf pan, wrap it in aluminum foil, and set a heavy cast iron pan on top of it. Heat a large nonstick skillet over medium-high heat, and add the slices of lamb. Brown on both sides (about 3 minutes per side). Serve in a warmed pita with lettuce, tomato, onion, and tzatziki. *If your food processor isn't large enough for all of the ingredients at one time, divide them all in half and work in two batches. *To freeze: Allow loaf of meat to cool completely. Cut in half, wrap each with foil, and place in a resealable bag. Defrost before slicing and browning in pan to serve.